That dude who got a KFC Double Down tattooed on his leg might've acted too soon, because a new meat-on-meat "sandwich" just rolled into town, and it's got one more meat than was previously thought possible: three. Check out that chicken, beef, and pork, son. The new KFC Zinger Double Down King, which is unfortunately only available in South Korea for now, features spicy fried chicken "buns", strips of bacon, and a burger patty with barbecue and white pepper sauces. While it's kind of strange that the US didn't think of this first, it's probably only a matter of time before someone over here makes one and deep-fries the entire thing, so that kinda makes up for it. 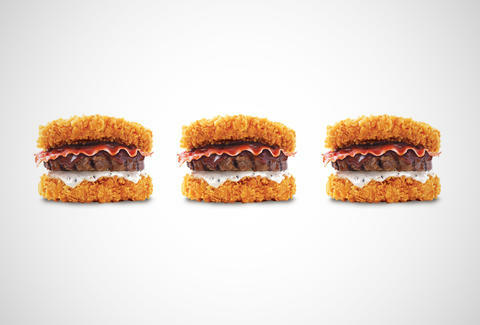 The KFC Zinger Double Down King contains around 750 calories, in case anyone who eats it really, really wants to know. Adam Lapetina is a Food/Drink staff writer for Thrillist, and would top this whole thing with some pastrami. Read his musings at @adamlapetina.